Some of the best athletes in the world who move the quickest, jump the highest, and beat out their competition, are not the most efficient or safest movers. You might see a great play during the game, but you don’t always think “he makes it look good”! Making a play look controlled, powerful, and athletic requires that that athlete properly uses his glutes. 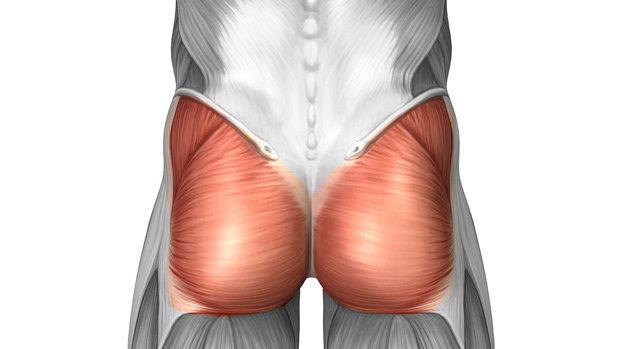 The gluteus maximus is the biggest muscle in the body, but many athletes don’t take advantage of it. Nor, its important neighbor, the gluteus medius. Without proper recruit of these muscles, athletes are forced to generate power and stability elsewhere. These compensation patterns, often requiring additional work from other muscle groups, can lead to reduced performance or even injury. 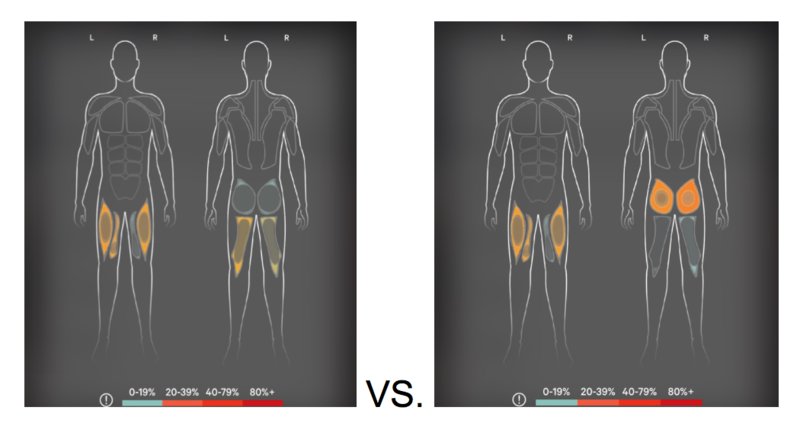 There are a variety of patterns athletes develop when they have inactive glutes, but a common compensation is firing the hamstrings before then and more than their glutes. Relying on the hamstrings can lead to lower back pain, knee pain, and a hamstring strain, on top of reducing power and speed. In the field, I commonly see top-tier athletes firing their hamstrings before and more than their glutes, even during walking. If their hamstrings are the primary mover while stepping; imagine jumping, pivoting and running when their mind is set on stepping into the end zone. With performance and injury prevention goals, many coaches prioritize glute recruitment in their program. Although their aim is to make the glutes the primary mover, there hasn’t been an easy way to measure if athletes are actually doing this, until now. This is one of the things that excites me most about Athos. Not only can we measure glute contribution during training, we can quantify the glute to hamstring ratio (G: H) after each session. We know that our coaches cannot watch Athos live-view to monitor glute vs. hamstring activation with each step an athlete takes. 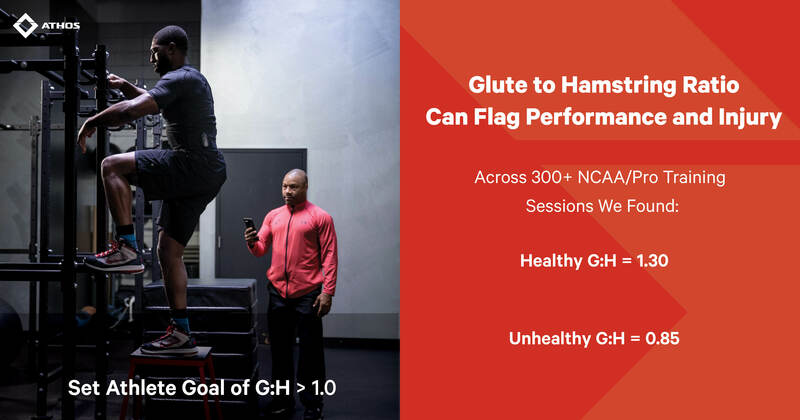 Tackling the overactive hamstring phenomenon by introducing glute to hamstring ratios (G: H) into post-workout reports has been a game-changer. We expect most movements, especially those requiring hip extension, to show the glutes. Understanding the G: H has allowed our coaches to make critical and unique decisions for each of their athletes. We have seen our coaches use G: H in baseline movement screens, performance tests and as a session metric in practices and strength training. In baseline screens, we have found that glute bridges and clamshells are great exercises to highlight the athlete’s reliance on the hamstring as a hip extensor and abductor. The results are surprising. One Pac-12 team saw 50% of their athletes using more hamstrings than glutes in bridging (G: H < 1.0) and 25% using more hamstring in clamshells. 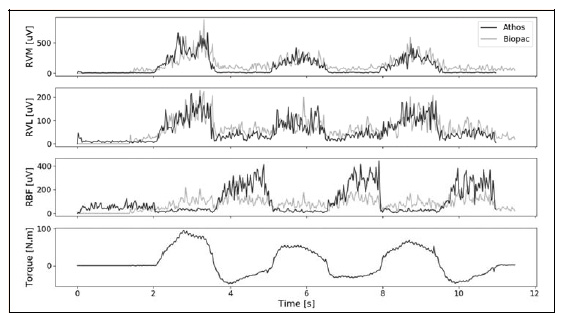 Identifying the issue by athlete, allowed the coaches to adjust their warm-up series, select which athletes needed technique work, potential intervention, and develop program goals to monitor progress in a new, impactful way. Here you can see that G: H can be a performance indicator as well as a flag for potential injury. 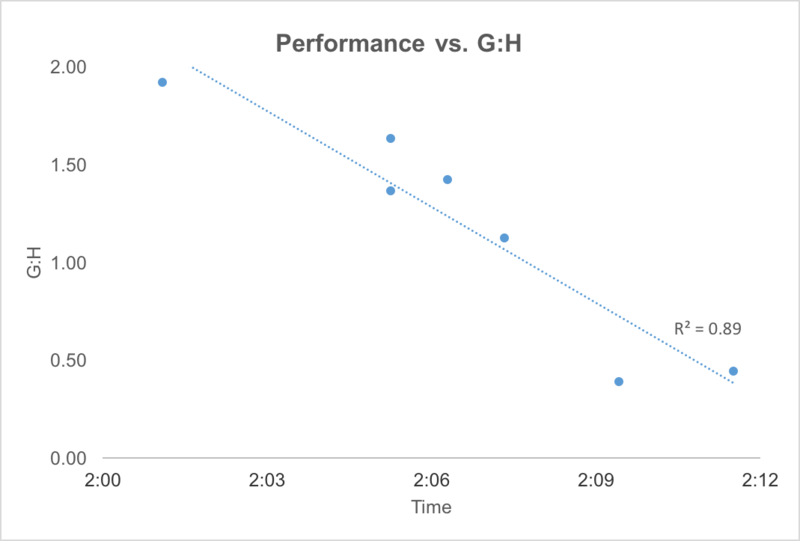 This Big-10 team monitored G: H during their timed performance test. There was a clear correlation between the top performances and fastest times. 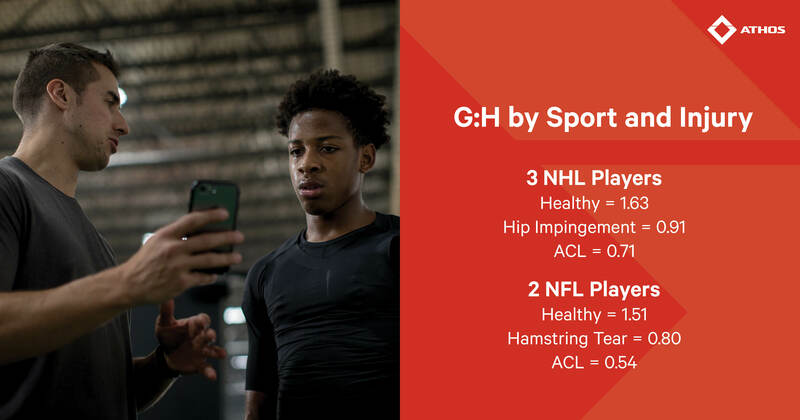 Lastly, from a practice perspective, G:H allows our coaches to have the right conversations with the right athletes and ultimately identify who might need more soft-tissue or structural work, program adjustments, technique coaching, or rest. 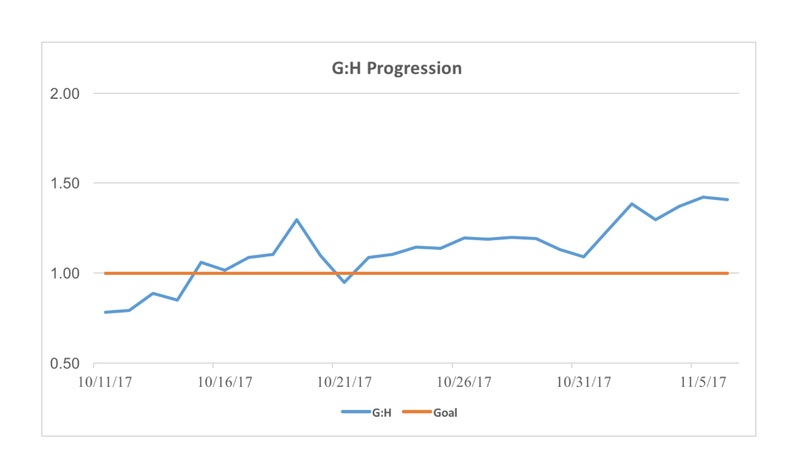 By tracking the G: H changes of individuals and the team as a whole, our coaches understand if their practice structure is causing movement pattern changes across the team or if there are one-off athletes needing more attention. For example, one Big-12 team found that their running backs averaged GHr of 1.39, while one athlete, with a history of hamstring strain, averaged a G: H of 0.72. 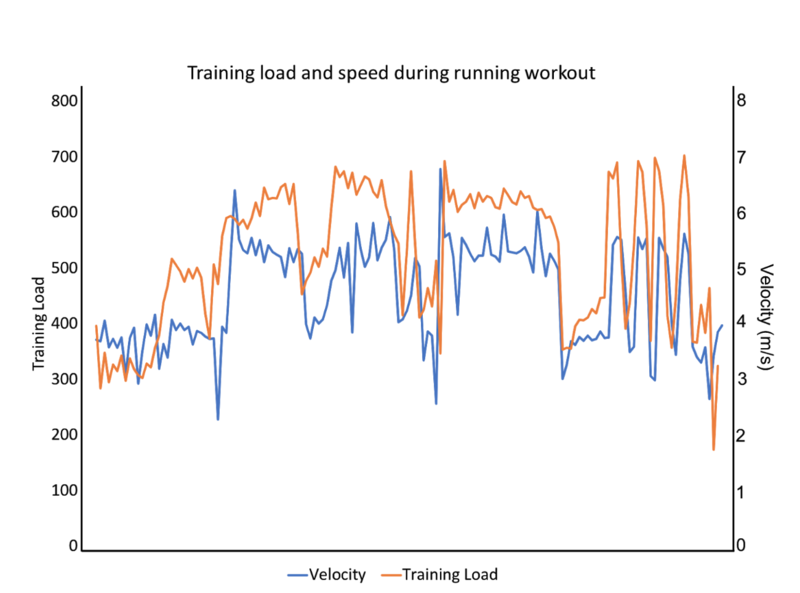 After flagging that the issue might not be resolved, the coaching staff placed the athlete on a unique glute activation program that increased his GHr above 1.0, while helping him to return to performance with no repeat injury.